The following surnames have eBooks on this page: Carter, Gifford, Hicks, Higgins, Liddy, Mahaffey, Mark, McFarland, Mickley, Sands, Sargent, Selleck, Wedge, Westhafer, Wharton, and Whitehead. Blue indicates softcover editions may be available. Welcome to Bookshelf 2 at Hawkeyes Trading Post! Carter Family History and Genealogy or History of Isaac P. Carter Family. PDF eBook English 8.18 MB. 1905. In May of 1816 frost killed off most crops that had been planted in New England. Then a large snowstorm in June of that year hit the same region bringing nearly a foot of snow, and the subsequent loss of many lives. Those plants that were lucky to survive in May failed in June since their cell walls became ruptured with the blanket of snow. This resulted in malnutrition and famine across New England. In July and August of 1816, lake and river ice were observed as far south as Pennsylvania. This historical event was referred to as: “Eighteen Hundred and Froze to Death” as those who experienced it would tell in their personal stories. This would be the story of Isaac P. Carter who moved his family from Maine to Ohio. They crossed the mighty Ohio River by raft with horse and wagon. 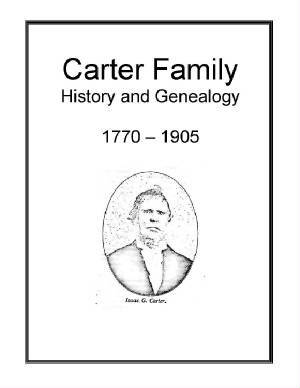 The genealogy covers 134 years of Carter Family descendants, from 1770 to 1904. A fascinating story that should be in the hands of every family member. Price $6.95 USD. Hicks Family History and Genealogy or The Family of Hicks. PDF eBook English 2.35 MB. 1902. 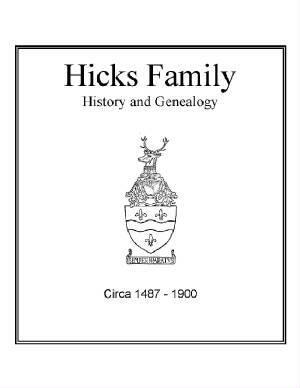 Family legend of the 14th century origins of the Hicks family name is revealed in this fascinating account of a very old family line. Sir Ellice Hicks, who fought under the Black Prince in France, was made a Knight Banneret by King Edward III with an accompanying grant of Arms. A timeline with dates of baptisms, marriages, and burials was developed from documentation extracted from various county registers. 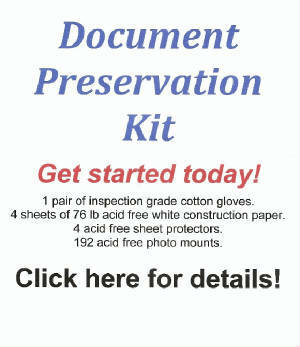 An excellent resource for the Hicks family genealogist! Price $6.95 USD. 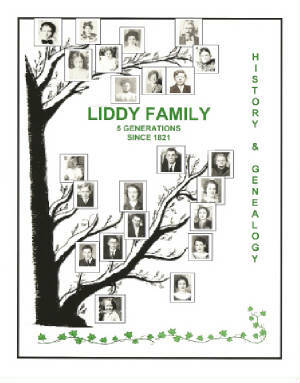 Liddy Family History and Genealogy. PDF eBook English 22.8 MB. 2006. John W. Liddy is the Americanization of Johann Ulrich Luetty who was probably born in Switzerland in 1821. When he was 32 years old he married Amanda Kemp on June 17 of 1853 in Wells County, Indiana. Amanda was born May 29th of 1832 in Clark County, Ohio to Salomon and Magdalena (nee Baker) Kemp. They had 5 sons, and several daughters. Their son Joel Liddy was born in 1860, and he had 2 sons and several daughters. Descendants spread through the Midwest states of Michigan and Indiana. Numerous rare family photos, historical family documents, and 5 generations of descendants since 1821 are documented. A must for all Liddy family members! Price $9.95 USD. Mark Family History and Genealogy or Genealogy of the Family Mark, or Marke. PDF eBook English 8.24 MB. 1898. A fascinating well referenced history of the Mark surname, with family legend dating back to 1066. Also, included is the link to the Bowscale family with the associated pedigree and family arms that was granted. A copy of an old vellum roll, which was compiled in 1746 for Jacob Mark of Dublin, is also documented. Numerous rare family photographs are included throughout this eBook. A magnificent genealogy reference for any family member! Price $6.95 USD. 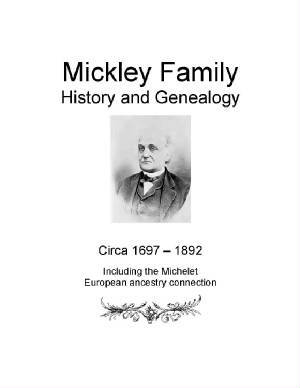 Mickley Family History and Genealogy or The Genealogy of the Mickley family in America. PDF English 3.18 MB. 1893. A fascinating legend is told that the family name came from “The Michelet of Metz” in the year 1444. Genealogy of family members from 1697 to 1892 provides significant information with dates. Included is an indexed list of over 700 family members! Several rare photographs are also included! This is a great genealogical resource! Price $6.95 USD. Sargent Family History and Genealogy or William Sargent with his descendants. PDF eBook English 20.8 MB. 1899. This information was saved from the deterioration of its content while gathering dust and decay on an old bookshelf. 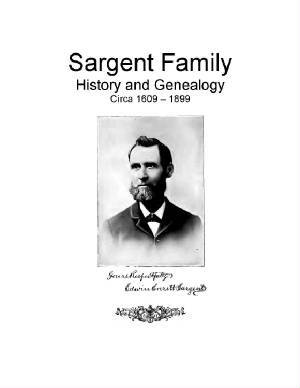 Genealogy of 10 generations of Sargent family member from 1609 to 1899 are presented along with short biographies, essential dates for descendants, and family lore! There are also 65 pages of indexed names for easy reference. A must have for any Sargent family member! Price $6.95 USD. 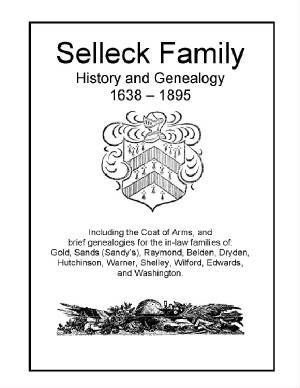 Selleck Family History and Genealogy or The Selleck Memorial. PDF eBook English 4.61 MB. 1915. 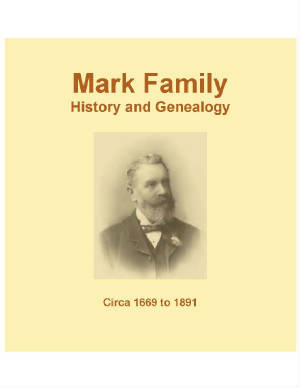 An excellent source of genealogical information for the years 1638 to 1895. Not only vital statistics and short biographies on Selleck ancestors during this period, but also information with biographies on family in-laws with their Coat of Arms! Those families are: Gold, Sands or Sandy’s, Raymond, Belden, Dryden, Hutchinson, Warner, Shelley, Wilford, Edwards, and Washington. A treasure of family history saved in eBook form against the ravages of time! Price $6.95 USD. Westhafer Family History and Genealogy or The Westhafer Genealogy. PDF eBook English 2.84 MB. 1912. Valentine Westhafer was born about 1703 and lived until 1785. The genealogy documents 8 generations of Valentine’s descendants up to the year 1912. Several hundred descendants including in-laws are noted. 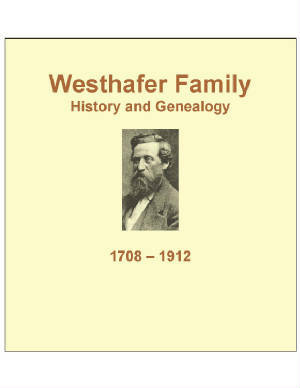 The family legend regarding the origin of the Westhafer name, and numerous rare family photographs are also contained in this extraordinary family genealogy! Price $6.95 USD. Gifford Family History and Genealogy. PDF eBook English 2.52 MB. 1896. William Gifford was living in Sandwich, Massachusetts in 1650. Together with others he purchased land from the Native Americans in April of 1665 to establish Monmouth, New Jersey. In Massachusetts he purchased 40 acres from a Suckanessett Indian named Job Attukkoo on July 24th, 1673. This is a fascinating story 300 years old of this Massachusetts settler, with his descendants, and genealogy. 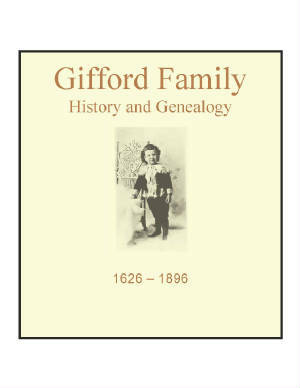 This is a great resource for the Gifford genealogist! Price $6.95 USD. 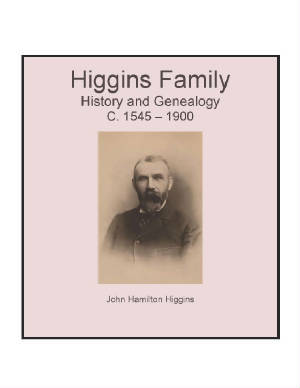 Higgins Family History and Genealogy or Richard Higgins a Pioneer Settler. PDF eBook English 42.4 MB. 1915. Family legend dating back to 1545 is revealed with extraordinary history up to the pioneer settler Richard Higgins of Plymouth, Massachusetts. His descendants and in-laws are compiled resulting in over 5,000 indexed family names! Numerous rare family photographs are also included. A wonderful reference for any Higgins family member! Price $6.95 USD. 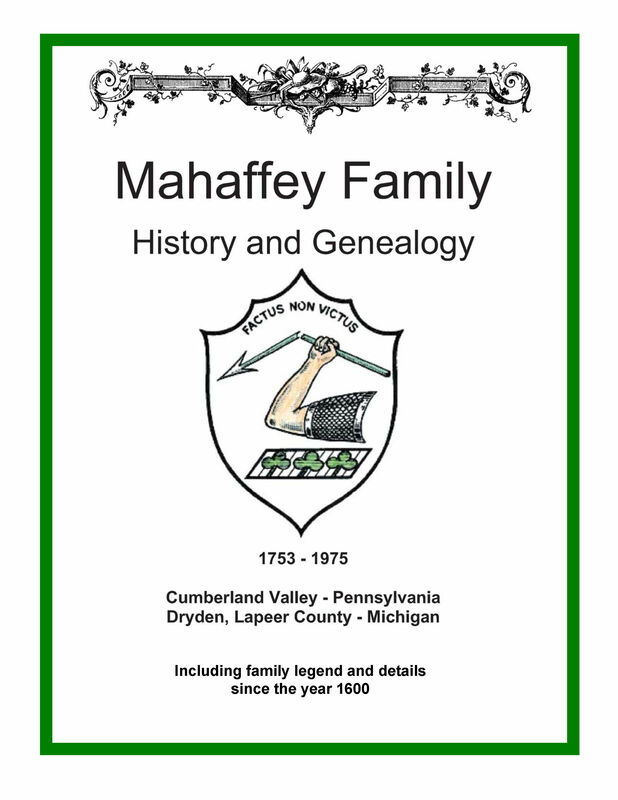 Mahaffey Family History and Genealogy. PDF eBook English 15.6MB. 2009. The Clan Mahaffey originally came from Scotland, and migrated over to Northern Ireland along with thousands of others from their Scottish homeland. Aye, then comes the tale of Charles Mahaffey, progenitor of the Cumberland Valley Mahaffeys, who immigrated from Northern Ireland to New England prior to June of 1753. His descendants were pioneers who bravely carved out their homes in the frontier of Ohio, and in the thick woods of the Northwest Territory, which became the State of Michigan. Family lore back to the year 1600 with numerous rare ancestral photographs. Thousands of Mahaffey ancestors listed! A great source of Mahaffey history for the family genealogist! Price $9.95 USD. 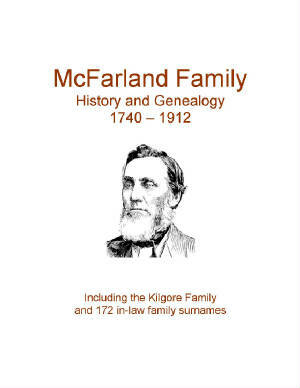 McFarland Family History and Genealogy or The book of the generations of William McFarland and Nancy Kilgore. PDF eBook English 5.74 MB. 1913. The family legend of the Clan McFarland is well referenced with an excellent history describing the Scottish highlands in ancient days. More than 300 names are chronicled, and a family genealogy is provided for both the McFarland and Kilgore lines. Over 172 in-law surnames are also revealed in this excellent family reference! Price $6.95 USD. Sands Family History and Genealogy. PDF eBook English 2.89 MB. 2009. Born in 1774 along the Greenbrier Valley of Virginia, now West Virginia, Matthew Sands married and raised a family through the “Year without a Summer” in 1816. His grandson, Samuel Field(ing) Sands, enlisted to support the War for Southern Independence with the confederated states! Their farms were along the Elk River in Braxton County, West Virginia. Listed descendants, and genealogy, stretch to Illinois, Florida, Tennessee and beyond. 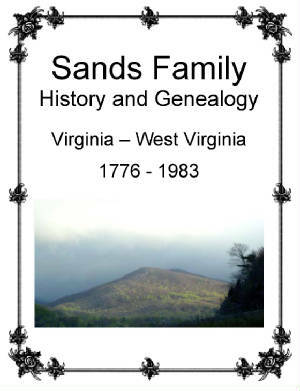 This is a great resource for the Sands family genealogist! Price $9.95 USD. Wedge Family History and Genealogy. PDF eBook English 9.87 MB 2010. 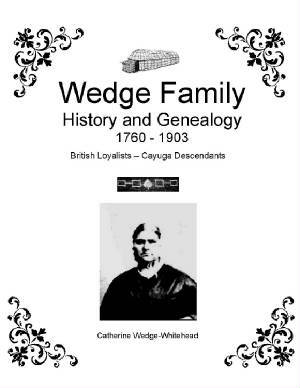 Family legend is that John Wedge (1760-1818), a United Empire Loyalist, married Tawanga a “Noble Woman” of the Cayuga Tribe, and daughter of a Cayuga Chief. After their marriage, in accordance with “Longhouse Customs,” they likely lived on the Grand River Six Nations Reserve in Ontario, Canada, until John’s Crown Grant in 1802 was finalized. A step back in time of 250 years for the Wedge family genealogist! Price $9.95. 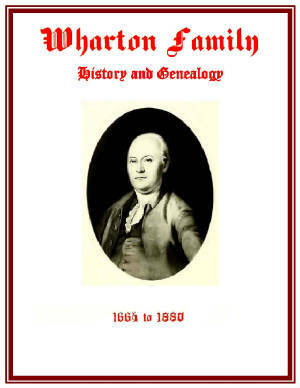 Wharton Family History and Genealogy or Genealogy of the Wharton Family of Philadelphia. PDF eBook English 8.42 MB 1880. This eBook not only includes genealogy for descendants, but also enchanting short biographies, letters, family Coat of Arms, and many rare ancestral photographs. Spanning over 215 years, covering history from the year 1664 up to 1880, there is an 11 page index which includes kindred and marriage connections. Extraordinary information for anyone in the Wharton lineage interested in family genealogy! Price $6.95 USD. 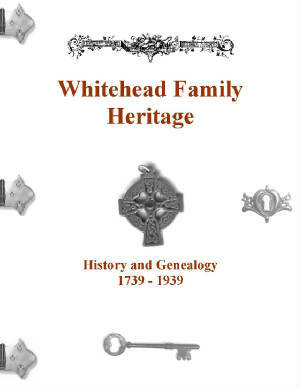 Whitehead Family Heritage 1739 to 1939 – History and Genealogy. PDF eBook English 10.3 MB. 2010. The Whitehead family legend dates the family name back to the year 1066 with ancient ties to Scotland. The vital information in this eBook begins with Richard and Mary (nee Grigsby) Whitehead of Stockbury, Kent, England with 200 years of descendants listed. Of their 11 children 5 were sons. Four of the sons have known lineage that indicate a total of 36 children between them. Of these 36 children 20 were sons that carried on the Whitehead family name. Yes, Richard and Mary Whitehead had 20 grandsons and 16 granddaughters! One grandson named Moses Whitehead immigrated to Canada about 1837, and married Catherine Wedge in 1847. Family legend is that Catherine descended from a “Noble Woman” named Tawanga of the Cayuga Tribe. The lengthy Ahnentafel ancestor table from Richard and Mary is contained in this eBook. There are many rare family photographs, documents, and the eBook is referenced for further research. Many Whitehead families may link back to Richard “of Stockbury”! Price $9.95 USD.